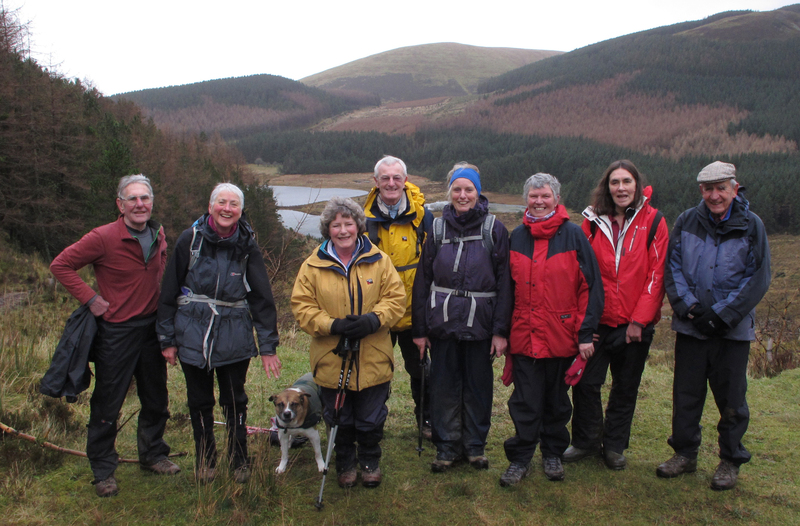 The Mockerkin Mob walking group was started in 1989 by Alan Gane, MBE and consists of a small group of people who live in the area. There are two walks every month, the more ambitious “A” walk on the second Sunday and the “B” walk on the third Sunday. The walks are advertise in The Link and in the Local Events page of this website here. For more info about the Mob, contact Joan Warren or Judy Hudson. For information about current walks click here (April 2019). In February 2014 the 25th anniversary was celebrated. The full report and pictures follow. It was the 25th Anniversary of the Mockerkin Mob in February and we celebrated in style! 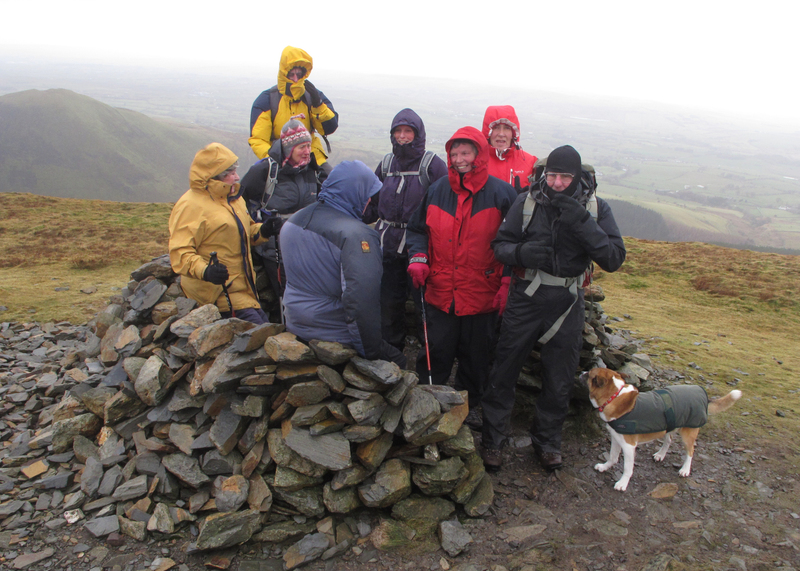 There were two walks arranged for the morning: a repeat of the first walk up Blake Fell and a walk around Cogra Moss. 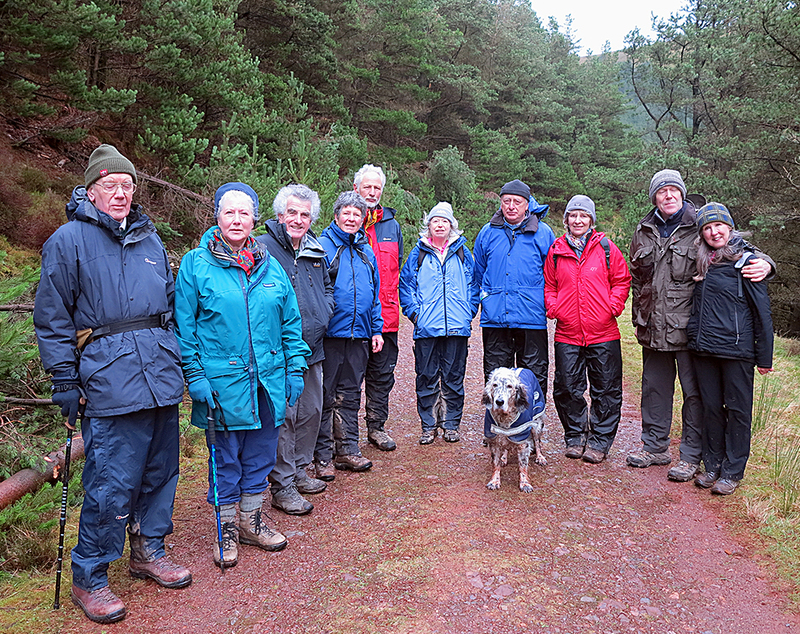 Alan Gane, the founder, led a much appreciated walk around Cogra Moss; he expressed surprise during the coffee break: apparently on the early walks they did not stop until reaching the top! Irene Graham, who was on the first Blake walk on 12 February 1989, successfully led a party of nine up an extremely windy Blake Fell. The Blake walk ran to the original style and didn’t break for coffee until the wood on the way down. 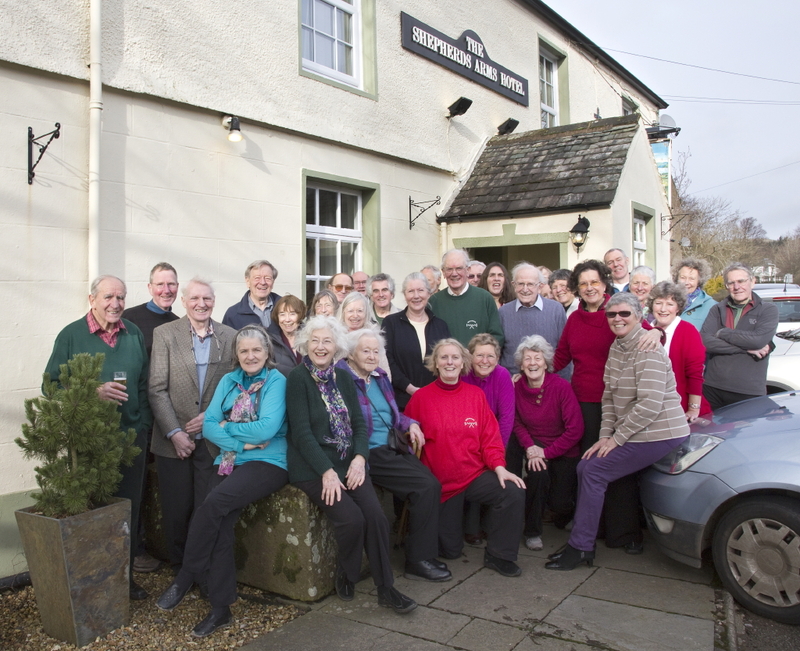 Thirty two of us then gathered at the Shepherd’s Arms at Ennerdale Bridge, where a group photograph was taken. Keith Milburn, the landlord, had closed the pub over lunch to accommodate us and we were able to all sit down together in the bar to an excellent meal of Hotpot and Sticky Toffee pudding. It was lovely to be joined by some of the original and early members, Anne Style, Mary Alderman and Tom Bird. 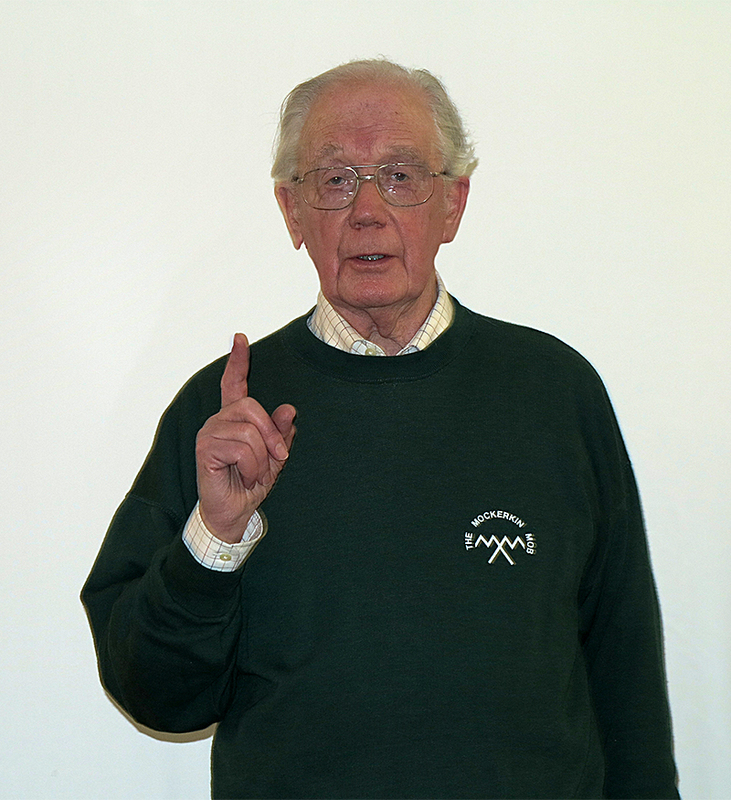 We were very kindly given a separate room for our post lunch celebrations and Alan, wearing his green Mockerkin Mob sweat shirt, started by reflecting on the beginnings of the Mob. Judy Hudson then read out a message of memories and best wishes from Robert Flower who was leader after Alan and Loes van Cappellen followed with some memories of her time running the Mob: it was all very much appreciated and enjoyed. John Macfarlane presented a slide show ‘The Mockerkin Mob, 25 years, Mountains and Memories.’ He began by estimating the distance covered and height ascended by a Mob member if they had been on every walk! The walker thought to have been on most walks was unanimously agreed to be Irene and it was considered that if she had been on every walk then she would probably have walked around 2435 miles –over 13 of Wainwright’s Coast to Coast walks. Height ascended was estimated at 632,900 ft – 22 Everests! The first part of John’s slide show was a comprehensive and thoughtful overview of the earlier days of the Mob with lots of lovely photographs of members, comments and views. The second part was a selection of John’s own more recent pictures including some from Antarctica and other far flung places as well as some stunning pictures of the more local views we know and love: these were all carefully woven into a story of John and Rosamund’s arrival in Loweswater and their joining the Mob. Everyone agreed it was a beautiful, moving and in places a very amusing view of the Mob. The day’s celebrations were brought to a close with an explanation by Joan of how the day had developed from a record of the first walk which Ann Style had found at the bottom a drawer! Judy followed by looking to the future of the Mob and confirming that the Mob remained as it had always been, a group of friends who enjoyed walking the fells together. Alan cut the cake and we all toasted the Founder and future of the Mob with a glass of fizz!